It seems fitting to begin this year’s reviews with the latest from last year’s best label, especially when the release in question is of such impeccable quality. Take note everyone: Andy Robinson’s Striate Cortex has not only set the bar ridiculously high but also nonchalantly hopped over it whilst the rest of us were taking off our tracksuits. What we have here is a square, black presentation box – the sort of thing a piece of jewellery might come packaged in – encircled with a sash bearing the title and name of the band. Sliding this off and removing the lid (decorated inside with gold marbled paper) reveals a square of fluff. This secures two mini-CDrs decorated with inky abstractions and housed within their own dinky black paper wallets. There are also three card inserts decorated with similar patterns on one side and the details of the release on the other. It is a remarkable object. I opened it gingerly, with a slack-jawed sense of wonder, knowing that Andy constructed each of these packages himself. All one hundred of them. Fortunately, the care, attention to detail and beauty evident in the packaging is justified by the music. 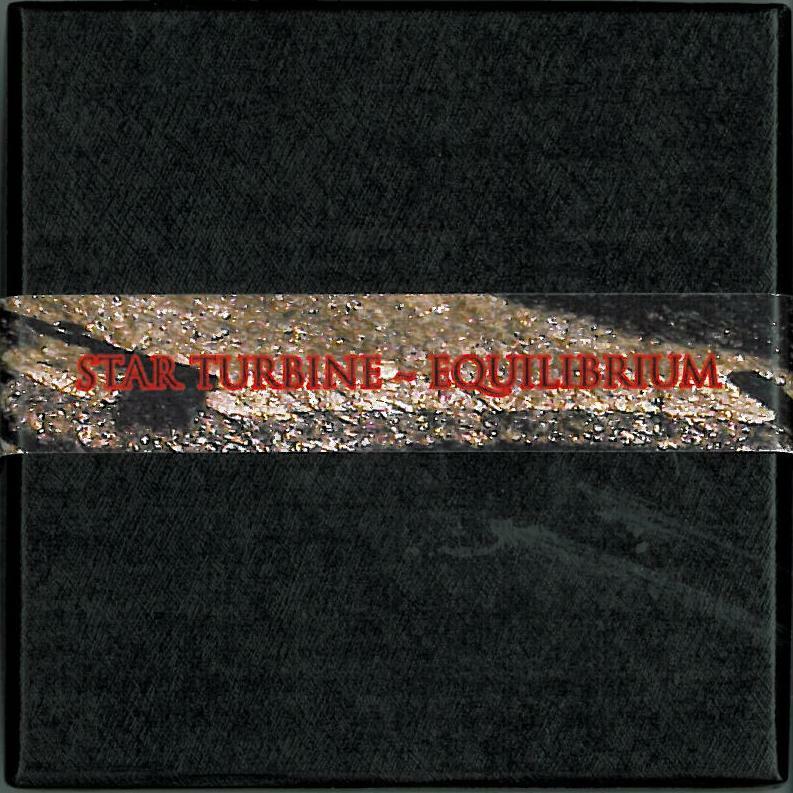 Star Turbine is a long-distance collaboration between ubiquitous force-for-the-good Sindre Bjerga and similarly busy multi-instrumentalist Claus Poulsen. The first of the two discs contains five shortish tracks of droning atmospherics augmented by guitarish scrapes and found sounds dropped in, looped and left to abrade each other. Whilst neither dubby nor minimal, these tracks contain a convincing evocation of space. Whether this is abyssal blackness or infinite sky depends, I guess, on the mood of the listener. The second disc contains two long tracks that explore similar territory but do so in a darker, more circumspect way. The emptiness remains but the agoraphobia is pitched a little higher in the mix. Could that hissing sound be a leak in your spacesuit? As with many of Andy’s releases, the compelling depth and mystery of this music is revealed on repeat listens. It stands up to scrutiny, in fact it benefits from it. The track titles invoke science terminology – ‘wave detector’, ‘molecular cluster’ etc. – in the same way that early techno used to do: to add a futuristic sheen rather than to refer to anything concrete. I suspect this is knowingly tongue-in-cheek as the game is given away both by the title of the track ‘Chromatic Underwear (Polyatomic Molecules)’ and by the burst of muted ‘Jupiter Jazz’ style joy-synth that makes a surprise appearance at its conclusion. Whilst the track titles can be put to one side, the concept of ‘equilibrium’ has more interesting structural consequences. This is not equilibrium in the sense of the solid-state, unchanging drones championed by, say, the underrated band midwich. This is equilibrium maintained by the delicate balancing of competing forces, made possible by a combination of seemingly coincidental factors, the removal of any one of which would send the marbles crashing down like a game of cosmic Kerplunk. There are various ‘quantity theory’ games that can be played by combining the elements of this release: are the two discs in equilibrium? The tracks on each disc? Each track within itself? Over the whole track length or does every moment have its own balance? It is an enormously impressive act, like a snail crawling up the blade of a knife. Aside: this is something that I actually saw happen back when I kept an allotment and grew some of my own fruit and vegetables. Enjoying a break from my labours, I was amazed to spot a snail ascending the cutting edge of a foot-long knife I had plunged point-first into the soil at my feet. This slow, death-defying glide was hypnotising – a living metaphor I knew would come in handy some day. The mud-filled cuts on my hands attested to the blade’s sharpness. When the snail reached the handle I did not throw it over the fence onto the road (the usual fate for such creatures) but, impressed, placed it on a cabbage leaf in the compost bin instead. *Ahem*, anyway – to conclude: the fact that Equilibrium can be had for a mere five quid plus postage strikes me as a fantastic bargain. In these straightened times we are all after ‘value for money’ and, whilst it might seem an odd concept to apply to art, I have to say this release has it in spades. A beautifully packaged object that will repay your attention many times over. Need I go on? More details here. Buy here.